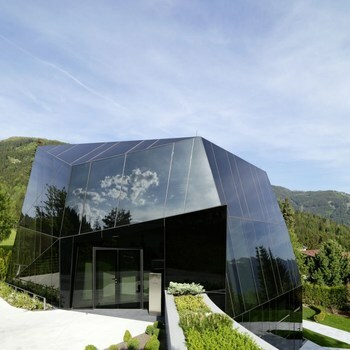 This residential conference and seminar house with a gross floor space of 600 m² offers spaces for 30 persons in workshops in an amazing mountain surrounding with a breath taking view on the Dolomite mountain chain in the Austrian region of eastern Tyrol, close to the region capital Lienz. In the upper floor there is located the conference room with adjoining sanitary and service rooms. The lower floor contains a combined living room and kitchen and two bedrooms with sanitary units for external lecturers. Main topic in developing the design this crystal made of tinted glass was the use of natural and artificial light.